Albert Mo and Eid Goh, of Melbourne-based practice architects eat, have been running their own show for most of their careers. But without any business specific training, the early years saw plenty of trial and error. One of their smartest moves, they say, was hiring a business coach. 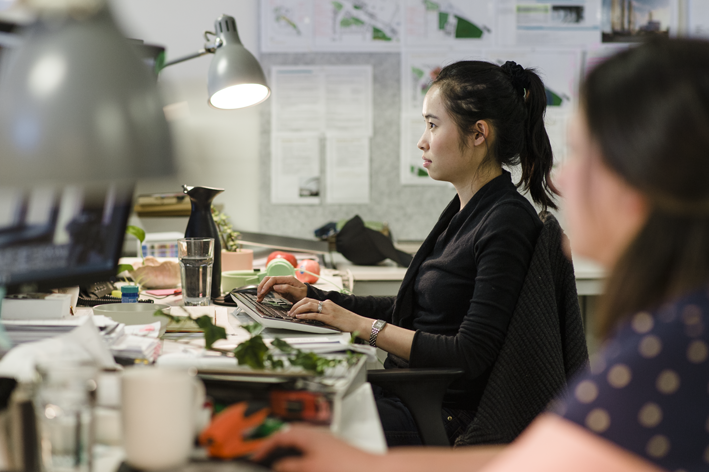 With a wall full of prize certificates and a formidable raft of acclaimed projects under its belt, Architects EAT is one of Australia’s most beloved and successful small practices. Established at the dawn of the new millennium by three young architects, it has been run for the last decade or so by two of those founders – the E and A of the practice name, Albert Mo and Eid Goh. Mo and Goh met at Melbourne University but didn’t really click until a process of attrition made their association inevitable. “There were 150 in the first year, a mixture of architects and 50-odd builders,” recalls Goh. What they had in common right from the get-go, however, was a shared tendency to work quickly. “Even back at university we’d be the students that would finish our work and be helping other people,” says Mo. For him, the fact that he was studying architecture at all was something of an accident. Born in Hong Kong and growing up in various places, including Singapore, as an international student in Melbourne, his intention was to study photography at RMIT. His father put the kibosh on that by proclaiming, “if you’re going to do that, you’re going to pay for your own school fees,” Mo recalls. “So I chose architecture, not as a second option, I did like it anyway, but it was a kind of deviation from what I intended.” Discovering that studying the subject was not just about science and physics, but that he also needed to understand history and theory (“which I hated in high school!”), he swiftly realised that he not only really enjoyed the discipline, but was also really good at it. Mo, on the other hand, grew up in Geelong, in regional Victoria and had a passion for design from the start. He aspired to be a graphic designer but enrolled in architecture when he couldn’t get into the RMIT course he wanted. During their time at Melbourne, the pair had a compulsory year out to work with an architectural practice. They both spent a period with Six Degrees Architects, while Goh also had a couple of months overseas. The idea of running their own practice came quite early – prompted by a telephone call from their erstwhile associate. Mo was writing his CV at the time, preparing to look for work in Sydney, so turned to his father for his input. Borrowing money from their families for the initial infrastructure, their enterprise was helped along by an early commission to design a golf driving range in the south-eastern suburbs of Melbourne. They did make some early decisions that served them well, however, underlining their commitment to the company. “We really decisively said that we were going to rent an office and not work from home… someone’s garage or study room or whatever,” says Mo. For the best part of the next decade the three founders – E, A and T – ran the practice before parting ways. It’s clear that the split wasn’t entirely joyful, although Mo and Goh are keen to stress their former colleague’s contribution. “Without all three of us there wouldn’t be a practice, so… obviously he contributed to a large extent to our earlier foundation,” says Mo. “Big time!” adds Goh. They both also agree, however, that the practice has ascended to another level since. In 2008 there were around seven or eight staff, whereas now they’re close to 25. At one point they did expand to 30, but found that was heading in the wrong direction for them. “We quickly withdrew as a means of controlling the chaos and number of people we had to manage,” explains Goh. 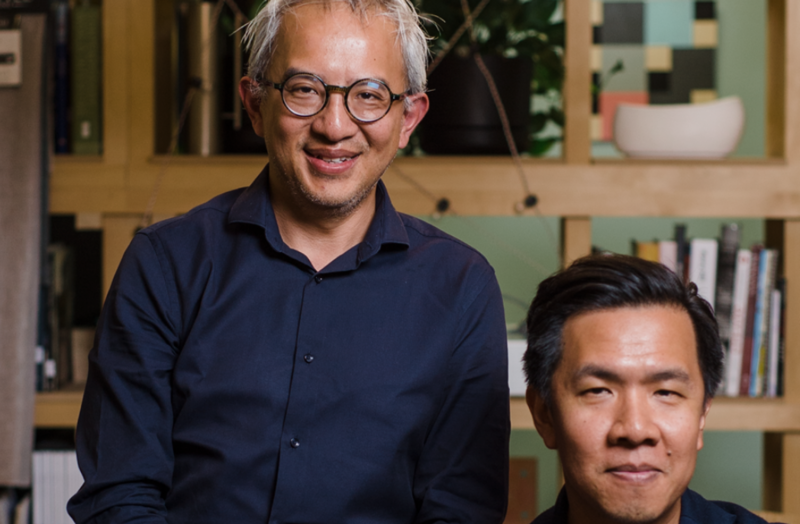 Due to celebrate its 20th anniversary in 2020, the practice’s current model is that Mo and Goh remain as sole directors and proprietors of the business, supported by senior management teams. Those senior positions are very carefully thought through, they say. “The important thing in the feedback that we’ve had is that, once you give someone a boundary or sector or particular duty, this means more than the title of ‘associate’ or ‘director’,” says Goh. When the practice started, it was the pair of them looking after all the administration, IT and human resources – areas they really knew very little about. How did they manage? “A lot of the time it was probably through trial and error,” admits Goh. “Learning on the fly,” adds Mo. A lot of mistakes were made,” concludes Goh, ruefully. What they did have was support. Other local practices and individuals, such as their former colleagues at Six Degrees, were always happy to pick up the phone. “I think we are a generation of architects that are willing to share,” says Mo. “We talk a lot and that’s one way for us to learn how to run a business.” One of the things they learned was not to undersell their own work. They say the biggest mistakes they made in the early years were compromising on briefs, but at the same time they learned how to run the business by approaching it in the same way they would an actual architectural project. “We think creatively. We know there’s a set task, so we find a way to do it,” explains Mo. In the early days of EAT, there wasn’t much thought given to how it would evolve. “It became very much like the hamster wheel, where you just keep working and completing a job, working and completing another job,” recalls Goh. But after the split in 2008, the pair realised it was time to take stock and plan strategically. The first thing they did was rebrand. They organised new collateral, and a new website and then looked at really future-proofing the business. Realising their most important asset was their human resources they began to reinvest in them, equipping the staff better and moving offices from South Yarra to a bigger and much more impressive space in Collingwood. Most importantly, they hired a business coach, who came in and helped them to restructure the entire practice. The process took nearly a year, but was certainly worth it. “It was a very well controlled program that we set out to achieve different milestones at particular times,” explains Goh. Integral to the new business model was promoting one of the staff to be the general manager of the practice. And what of succession? Architects EAT is still a relatively young practice but have they considered what happens later? Goh says he does think about it every Saturday when he’s relaxing with a latte. Architects EAT out: Crux & Co.